Is the name Kifaya’s Kitchen or Kafaya’s Kitchen? 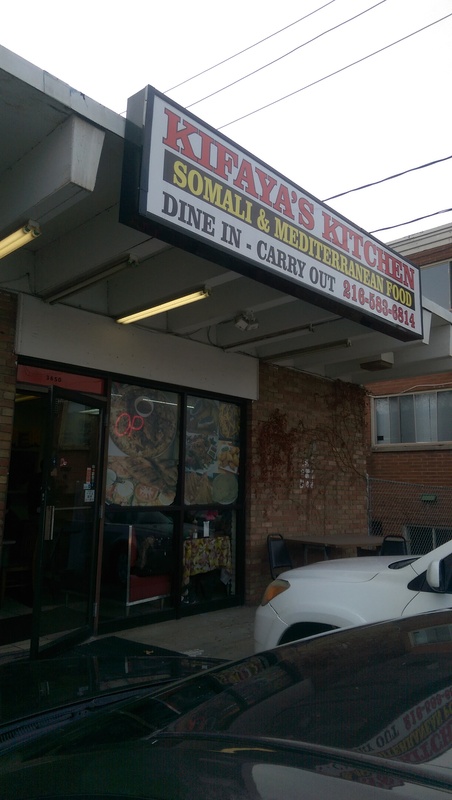 According to the storefront sign it is Kifaya’s Kitchen, but social media calls it Kafaya’s Kitchen. No matter the spelling, I call it delicious. The phone number on their Facebook page is disconnected. The phone number on Yelp (below) works. Kifaya’s has been in business since 2013. One of my friends had read about it and wanted to try it, so I scheduled an evening with some fellow adventurous diners. I had never had Somalian food before and didn’t really know what to expect. As anyone who follows me knows, I love being adventurous and will try anything. Ethiopian? Bring it on. Afghani? Yum. Squid on a stick? Yes, please. It turns out Somalian is like a cross between Arabic, Mediterranean and Indian with a little Italian thrown in for good measure. It is an unassuming storefront on W. 117th. The place itself is very small, and there is a limited menu. 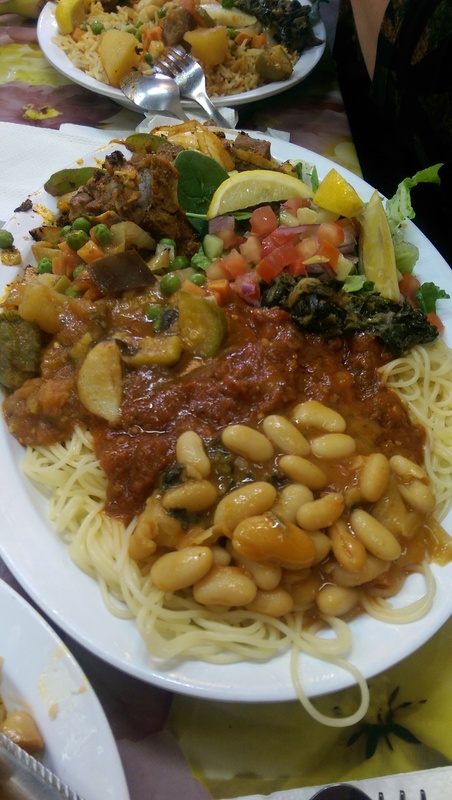 You can order goat, chicken, fish, beef or vegetable with pasta or rice. The door was propped open, but since it was 35 degrees out and we were right by the door we asked to close it. It then got quite hot with the door closed. It appears their ventilation system is inadequate. They were very accommodating for our large group of ten (with a reservation since it was a larger group – I wanted to give them a heads up we were coming). We almost filled up the place on our own, although there were two other tables of diners when we arrived. We sat around a long table and pulled chairs on the ends. I was glad I had called ahead. Orders are placed at a counter (where you also pay at the end). We ordered in waves in order to not overtax the kitchen, but it turns out that was unnecessary. People who ordered last got served at the same time as the first wave of people who ordered because we had ordered similar things. It took a little longer to get the Kaykay delivered to the table, because it was a little more involved. There is a sink in the dining room to wash your hands. Beverages and bananas were brought out while we waited for our food. Pro tip: the bananas are not an appetizer. They are to be sliced or mashed and mixed with the rice or pasta. The food was quickly brought to the table, and any minor mix-ups were quickly rectified without complaint. Everything here is made from scratch, meat tossed upon a large flat-top grill and sautéed with vegetables and an array of spices. The quality of the food was excellent. It is very reminiscent of Indian food, with shai (chai), samosas and jabatic (chapati-like flatbread) served along with stewed or grilled meats and veggies. I ordered the goat with rice and vegetables, and another friend ordered the chicken so that we could try both. Others in the group enjoyed pasta (angelhair pasta – although they call it spaghetti) or Kaykay (grilled jabatic mixed with goat gravy) instead of rice. The goat had some bones, but it was so tender that the meat easily fell off the bone. I enjoyed the goat, but preferred the chicken. The chicken had a very nice grilled flavor to it. The Basmati rice and sautéed vegetables were absolutely outstanding. The rice is flavored with fenugreek, cumin, coriander, cardamom and turmeric. I loved the sautéed greens, white beans and rice. Other vegetables include peas and carrots, potatoes, and okra. They also served a green chopped salad of greens with cucumber, red onion, green pepper and tomato with fresh lemon for acidity. Squeeze bottles of hot sauce and ranch dressing were delivered to the table, and the server suggested the ranch went particularly well with the chicken. I just put it on my salad, preferring the taste of the meat to be unadulterated. The jabatic was like Indian griddled bread, but slightly sweet. It was a little greasy, but it was very thin and light, reminiscent of a scallion pancake. It had a slightly sweet flavor to it. We used forks, but I could imagine using the jabatic as a kind of injera to eat the food with our hands. The kitchen served us chicken samosas when several of the folks had only ordered the beef. The server put it on the table, and we cut it into 8 pieces and shared it. Someone then did the same with the beef samosa. The filling in both samosa was different from Indian samosas. It was ground meat with some onion and no vegetables like the Indian potato and peas that I could see. The samosa themselves were perfectly fried and not at all greasy. The pastry was very delicate, and the filling was very flavorful. I think I preferred the beef over the chicken, but both were lovely. The beverages are all $1 each. I ordered the shai (Yemeni tea), which I loved. I rarely find a chai that I enjoy. The flavors of cardamom, cinnamon, nutmeg, ginger, and clove really shine here. I ordered it with milk, but it is also available without. I find most chais watery. Not so here. It was absolutely perfect. I had also ordered two cans of soda, but since the food was not as spicy as I expected I ended up taking the second can home with me. They had a container of what looked like mango juice in the dining area for people to drink, but it was almost gone by the time we were there. The portions were enormous, and most of us got boxes for our leftovers. I will be definitely going back again soon. I want to have the chicken again and really want to try the fish as well. If you want to have a fun culinary adventure, I recommend checking out Kifaya’s Kitchen. It is open every day from 11 a.m. until 9 p.m.
Ferrara's Italian sub with sweet peppers - just $5.99!